by GARY YAMASAKI The film Being John Malkovich presents the intriguing concept of a portal providing access into the mind of real-life actor John Malkovich. So, a character uses the portal to get inside this actor’s head, and the camera follows the character and shoots out through Malkovich’s eye sockets to show all he is seeing. Thus, the viewers are provided with the ultimate subjective experience of this actor, an experience which makes a strong contribution toward the viewers coming to merge with the character. And this contribution is rooted in the crafting of point of view on the psychological plane. Point of view on this plane has to do with the degree to which access to the inner life of a character is provided to an audience. In biblical narratives, such access usually comes in the form of inside views, that is, statements by the narrator about what a character is thinking, feeling, realizing or reasoning–anything having to do with what is happening in the character’s brain. So, even a statement on what a character is seeing or hearing would qualify as an inside view in that it is indicating what visual or audio data is being registered in the character’s brain. So, if the presence of inside views of a character make a psychological-plane contribution toward readers coming to merge with the character, what is the significance of an absence of inside views? Consider the case of Abram in Gen 12:10-20. 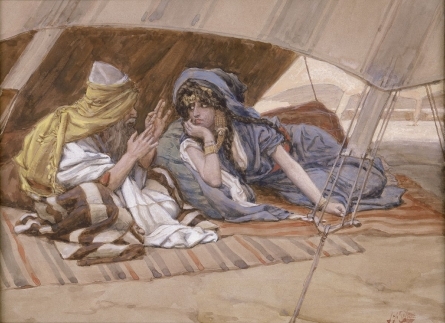 As he and Sarai are about to enter Egypt, he expresses concern that because of Sarai’s beauty, the Egyptians might kill him to remove an impediment to their getting to her, and so, he instructs her to say she is his sister. The Egyptians do notice her beauty, and she ends up in Pharaoh’s house, and Abram ends up with a wealth of sheep, oxen, donkeys, slaves and camels. But when it is discovered Sarai is actually Abram’s wife, she is returned to him, and he gets to keep all he had received–so, material suggesting Abram is thinking about what will happen when they enter Egypt, and is anxious about his prospects. The narrator could have reported this thinking and this anxiety by means of inside views, but does not. It could be that no inside views are provided here simply in keeping with the style of the time, which did not delve into the inner lives of characters very much. However, there is an alternative way of explaining this lack of inside views. It could be the narrator does not state “Abram was anxious” or “Abram thought he could prevent being killed if Sarai claimed she was his sister” simply because neither of these statements is true, that is, Abram was actually not anxious about being killed. The only reason we think he was anxious is because his direct discourse to Sarai reflects this idea, but does his direct discourse reliably reflect the actual situation? It is almost universally held that all biblical narrators are reliable, and therefore, anything said in narratorial speech–such as inside views into what a character is feeling or thinking–can be taken without question as true. However, only the direct discourse of characters who have been established as reliable reflectors of the narrator’s views is considered reliable. And because Abram has not been established as one of these, the veracity of all his words is open to question. And when we start questioning the veracity of Abram’s words here, we quickly discover it might be that Abram was not the least bit anxious about being killed, but lied to Sarai when he told her he was, as a way to compel her to say she was his sister. Why would he do that? Well, look at how the story turns out. Because Sarai is taken into Pharaoh’s house, Abram is showered with considerable wealth, which may have been his ‘end game’ right from the start. To be clear, I am not here making the claim this was indeed Abram’s thinking; many other factors need to be drawn into the discussion in order to come to a determination on this interpretative issue. What I am doing here is simply indicating it is possible this passage is intended to be understood in this way, and it is the psychological-plane observation the narrator chooses to reflect Abram’s inner state indirectly through his own words, rather than present it directly through inside views of Abram’s inner state, that opens up the possibility of this alternative understanding of the passage.